Gorefield started out in 2011 in Brisbane, Australia. From the name of the band alone, I was certain this was going to be good old-fashioned death metal. Surely it doesn’t get much more death metal than ‘Gorefield’? Well, names can be deceptive. Old-fashioned, yes, but there’s no death metal here – this is thrash all the way. 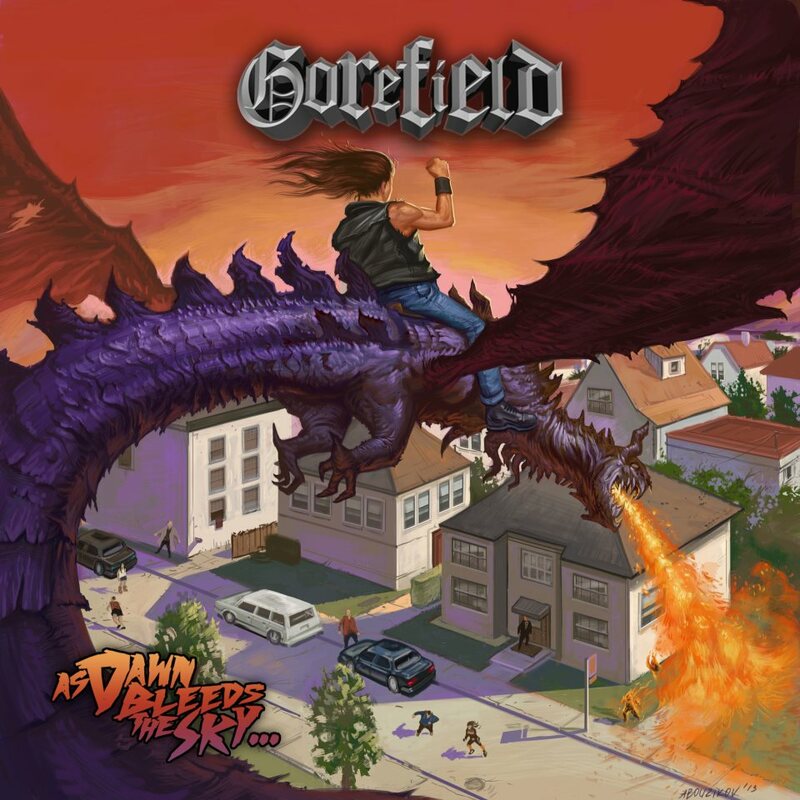 Gorefield’s first full-length release As Dawn Bleeds the Sky… is pure old-school thrash metal through and through. In fact, Gorefield do old-school thrash really well. It’s like stepping back to the early nineties and my first reaction was that fellow Observer man Matt Reifschneider, our very own thrash vacuum, had missed out by not claiming this one for himself. Any number of thrash bands from the USA from the late ‘80s or early ‘90s would be valid reference points for As Dawn Bleeds the Sky… and I would pick Flotsam & Jetsam as probably the closest match. The guitar sound is similar to that of Michael Gilbert’s crew and the vocals aren’t too far away. The big harmony choruses scream classic thrash and the album is full of catchy songs. Cap it off with a fantastic album cover and the signs are very positive. Tracks such as “Love Thy Enemy”, “Playing With Fire” and “End Of The Night” are catchy, yes, but catchy does not always equal good. I’m sure we’ve all heard irritating pop songs that can get stuck in your head for days and while I’d choose Gorefield over irritating pop songs any time, the quality of the songs here isn’t great. This isn’t a bad album by any means, it just lacks variety and standout moments to set it apart from run-of-the-mill metal. There are a few highlights along the way, such as the enjoyable chorus in “End of the Night”, a long instrumental section in the same song and the slightly more melodic approach of the title track. However, these slightly better moments aren’t good enough to elevate this to one of the year’s better albums. There is also a real lack of lead guitars, which I feel an album in this genre really needs. There are short lead guitar breaks here and there, but they are often noticeably absent. Gorefield is a band with a great sound and the ability to recall the glory days of thrash; they just need to come up with a better collection of songs next time to do justice to their undeniable talent. This entry was posted in Reviews and tagged Flotsam & Jetsam, Matt Reifscheider, Michael Gilbert, Thrash.